Just thought I would bring this topic up again. Wondering if anyone new is building an APA box module. There have been no new invitations, and I am thinking I wish I had worked out how to use the APA box to build a circular layout before I started. In fact thinking whether I should convert two to 1/35(1/32) to extend the circular layout I am building and building 2 new modules for Gn15. It won't be for a while as I am a bit busy with the other project at the moment. That project will take me through to 2014 (start of WW1 commemoration) . I know war is a touchy subject for some here, but being based in Accrington it is going to be impossible to ignore. The new circular layout should be ready next year, and will test the concept, but I am also building a simple 3ft by 2ft layout, initially set in 1919, but with a few changes can represent other post war time periods. I am not wanting to glorify war(hence the post war dates), but show the negative consequences, and how things don't change. Once this project is complete I should be able to get back to Gn15 APA box building again. Hopefully others will have dipped their fingers in the APA water by then. 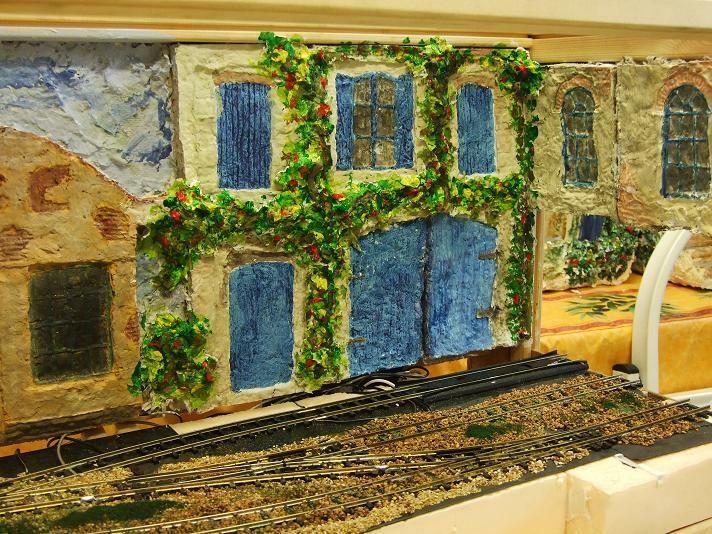 In the mean time I plan to exhibit one module as a shunting layout, in preparation for France next October. Just trying to find a suitable motorized chassis for auto shuttle to run at same time(Bachmann bogie tram is a contender as new motor is far far better than old and should be able to shorten to fit under Tuk Tuk. I've moved to O9 since the APA's outing to Telford in July, and disposed of two boxes to make space for the new layouts, but I still have Holmes Farm Jct, The Wharf, Warley Fen and two non-scenic fiddleyards available for shows if/when any other members are ready to join Simon and I on the exhibition circuit. I was hoping to make one over Christmas - if I did do so would I be OK to bring it to Stafford (assuming that you are showing there) and plug it into the display? it would certainly be better to have more people on board, which is why I am thinking of converting 2 boxes to 1/32(1/35), assuming my 3 box circle works. having had a close look at my modules, I haven't the heart to modify them, as all have some specific 1/24 detail, namely buildings. At least they are easy to store. I think just by building 2 curved end modules I can turn it into a continuous circuit. 5 boxes in car is just about possible. Well,my APA box is on order with Santa and should arrive on Christmas day. Plans are afoot. I want something that will offer some interest when it's not connected to other modules so a simple shunting layout. Probably a 3-2-2 inglenook (he says hoping that one will fit in an APA box) with the centre siding acting as the straight through line..
Only problem now is trying to track down the post with the necessary specifications in it: height of track above base of box, min size of mouse holes, etc .... if anyone knows where this is is there any chance that they could pin it to the top of this section of the forum to make it easier for us late comers? 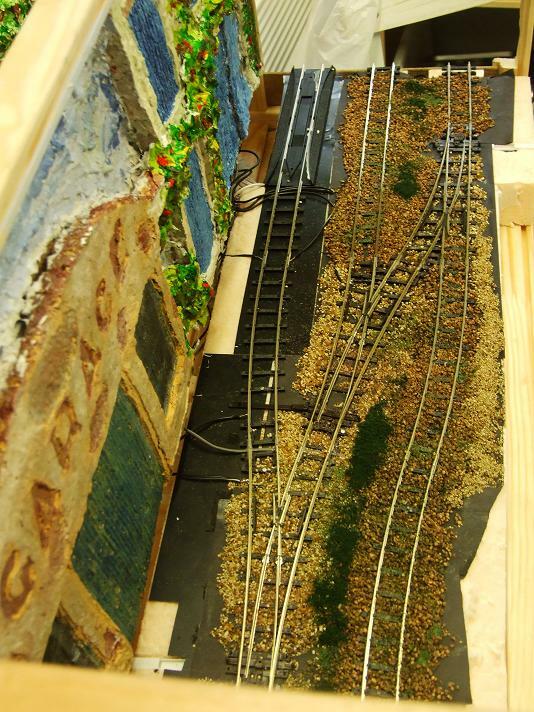 edit: after a poke around I believe that the track base height is 2in and the mouse holes are about 5in tall by 4in wide, with 5in of straight track leading up to them - does that sound right? The five inch headroom has proved to be over generous Si, probably get away with less if it makes hiding the mouseholes easier. Two inches above the internal floor is correct, this works out at about three inches above table level. Any slight inaccuracies in track height can easily be compensated for using packing under the box (or adjacent boxes) as required. I think an Inglenook might be a bit optimistic unless you're building very short turnouts. A tuning fork should fit OK though, Holmes Farm Junction has a single siding (albeit not used during normal operations). 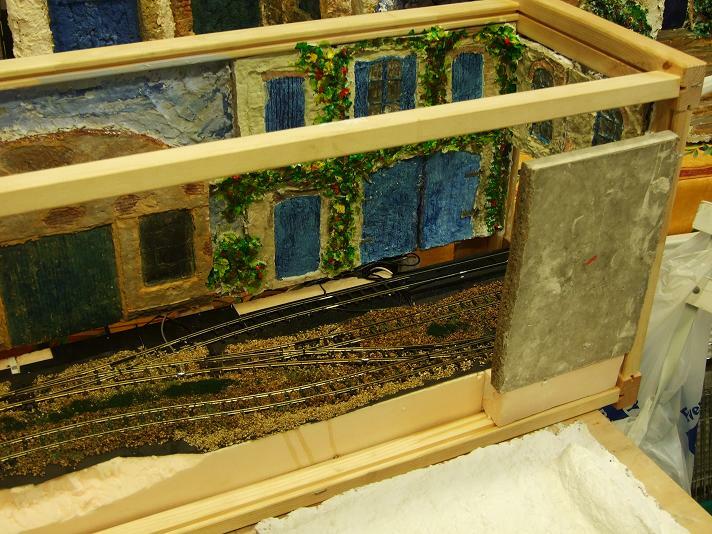 Simon's modules have more complicated track layouts but are designed to be used as a pair or three together. as to how much track can be fitted in box, I think I probably got the maximum amount possible. I used Setrack Y points which are not that sharp(33in rad), so with sharper points might be able to squeeze a bit more in. I wanted something which could either be used with other modules or on its own, or both. 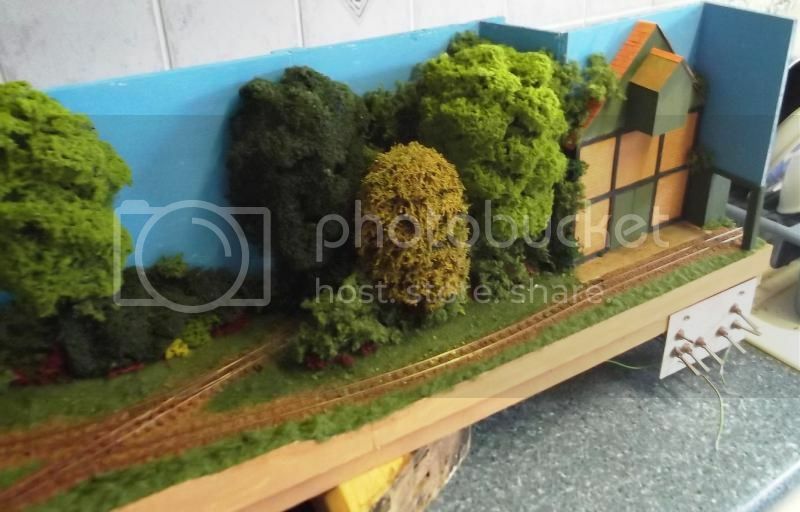 By that I mean I have a through track and a line behind with siding so you can in theory carry out shunting whilst connected to other APA modules. Yep, I was thinking that only the sidings and points are in the module - the head shunt is on an external board. For points I might measure up some OO three-wayers or make one of those clever things that I don't know the name of: it's like a turn table but had three pairs of rails on it. One curves to the L, one is straight and one to the R, so that you can drive straight from the entry road onto any of the three sidings. 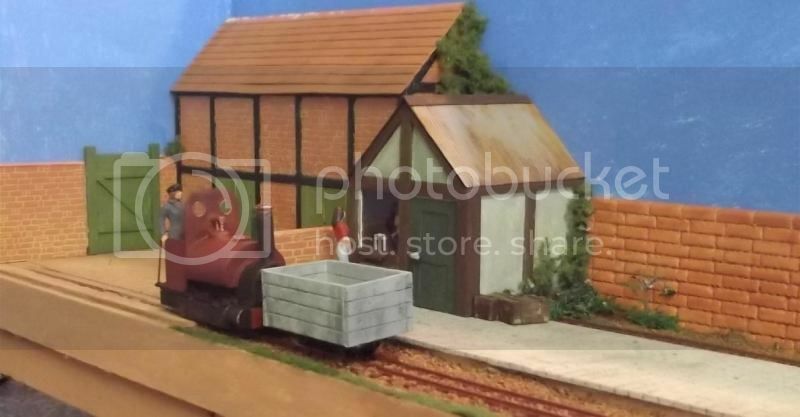 So if this thing is about approx 10cm long and the longest siding is three X wagon wagon length (15cm) then the overall length will be 55cm + a small lead in track. My module can in theory be run on its own, I intend to take it to France next year . There have been a couple of problems with track at front. I relaid part of the track, but it actually seems worse. This meant I set points to take through traffic on line at the back on the left end, and therefore could not do any shunting. I will have another go ove next few weeks. Here are the photos from early stages to show how much I fitted in. With short loco and small wagon , could shunt without extensions. It was seeing your module at Telford that decided me that I could build a shuntable APA module. I'd be interested to hear if those are Peco On16.5 points or if you've done a really good job of converting some short OO ones? To my eye they are looking like the On16.5 ones, but what do I know? The reverse curve at front does not sit flat. Odd considering its on a flat sheet of Space Board. When train runs through curve it rolls one way then the other. But I raised one rail slightly tonight and it seems OK. Will check tomorrow, but if this is OK will just do some more fiddling , packing up under the lower rail. looks like raising outer rail works, and if problem occurs again, die to subsidence then I can tweak it again, even at exhibition. Not sure if it will work with Bob's small loco, which was what highlighted the problem initially(maybe that is what caused it, ha ,ha ). Might need to impose a weight restriction. There is still some twisting so top heavy locos and rolling stock has to be driven very carefully. and also "real life"(TM) getting in the way. So new target is Easter . I was thinking of doing something based around Purfleet Quay, Kings Lynn, UK but want to confirm mousehole locations before I start hacking away at a brand new APA box. I know the track is 2" above base but what are the measurements from front of the box? I couldn't find it anywhere, but that may be operator error on my part !! Be gentle, I'm new to this. As one who is gnot gnew to this but still hasn't actually finished a module, within limits the distance front to back of the openings is up to you. I have one under construction where the centreline is just three inches from the back, one where it's four inches from the front, and one (my first design) where the two centres are 4.5 inches apart with an 'S' bend. I guess I'll finish one of them next time my wife's awy for a weekend and I can use the kitchen. As anyone who has seen what Bob and I have exhibited they will realise mouse hole can be anywhere, as long as track is 2in above base. Most have had holes in ends but no reason why a curved track with one hole at back, as I have been using for my current non Gn15 project. That the holes don't have to line up is something that I hadn't cottoned onto before (I have read that right haven't I?). It makes my APA layout work a lot better - which I really will start soon...just as soon as the O9 module is done.